SB 189, was signed by Governor Brown, and will take effect July 1, 2018, where all owners of medical corporations will be able to exempt themselves from workers’ compensation coverage, regardless of percentage ownership, as long as they submit a waiver and have health insurance coverage. For more information click here and go to California News. The Department of Health Care Services has taken steps toward improving interpretation serviced for Med-Cal patients, and hired a lead employee to carry out an evaluation of interpretation services for Medi-Cal patients. Director Jennifer Kent said the new addition will spearhead the project, which was mandated by an assembly bill that passed last year. For more information click here and go to DHCS/Medi-Cal News. MOASC Member, Cedars-Sinai, invites you to register now for their 6th Annual Experimental Therapeutics in Oncology: The Road to Personalized Medicine. This important educational activity will provide guidance to front-line and oncology clinicians, oncology nurses, physicians, pharmacists, nurse practitioners, physician assistants and pharmacists with current information about new agents in oncology and the translation of the latest research to their patients. The sixth annual Experimental Therapeutics in Oncology: The Road to Personalized Medicine conference will cover drug and treatment updates with a focus on new agents in breast cancer, GI malignancies, and head and neck cancer. For more information click here and go to MOASC News. We need your help now, ONE LAST PUSH! Please contact members of Congress in the U.S. House and urge them to vote YES on H.R. 849. Last week, California Congressman and Majority Leader Kevin McCarthy (R-Bakersfield) announced that the U.S. House of Representatives plans to vote THIS WEEK, Thursday, November 2, 2017, on a bill that would finally repeal the Medicare Independent Payment Advisory Board (IPAB). For more information click here and go to National News. MOASC & ANCO are continuing to work with state providers and organizations to advocate for reforms, and increase public awareness, to prior authorization and formulary exclusion policies. For more information click here and go to California News. MOASC has signed a letter to key members of Congress urging their leadership to modernize the 340B program. A follow up letter thanking them for holding an informational hearing on the matter and encouraging continued support and prioritization of this important issue, was also sent with MOASC’s signature. For more information click here and go to MOASC News. ASCO urges all ANCO and MOASC members to contact their Congressional Representatives to ask them to sign onto the Roberts/Carper MIPS letter to the Department of Health and Human Services urging exclusion of separately payable Part B drugs from the application of the MIPS adjustment. The last day to sign onto the letter is October 25. For more information click here and go to National News. The American Board of Medical Specialties and its 24 member organizations are collaborating to re-evaluate how physicians are certified for continued practice. The initiative, called Continuing Board Certification: Vision for the Future, will bring together multiple stakeholders to create “a system of continuing Board certification that is meaningful, relevant, and of value.” For more information click here and go to Affiliate Association News. Governor Brown has signed the following bills into law: AB 658, that suspends the state’s clinical laboratory license renewal fees for two years, 2018 and 2019. The bill is a result of an audit that found that the California Department of Public Health (CDPH) had collected millions more in laboratory fees than it had spent operating the Laboratory Field Services (LFS) branch. The fund’s current reserves exceed $22 million. For more information click here and go to California News. MOASC members who are in the area, are encouraged to attend a reception in honor of Assembly Member Mike Gipson on Tuesday, October 24th in Compton. CAPP is hosting the event and will be held at the Medical Offices of Dr. Toni Johnson Chavis (403 S. Long Beach Blvd., Compton, CA) from 5 p.m. – 7 p.m. and go to MOASC News. On October 3, 2017, the Food and Drug Administration announced updates to three final guidance documents, including Form FDA 3926 and its instructions, to simplify Institutional Review Board (IRB) review requirements for physicians seeking to treat an individual patient with an investigational drug under expanded access. and go to National News. CMS will host its 2016 Annual QRURs Webcast on October 19 at 10:30AM PDT. The webcast will provide an overview of the report and explain how to interpret and use the information. and go to CMS News. 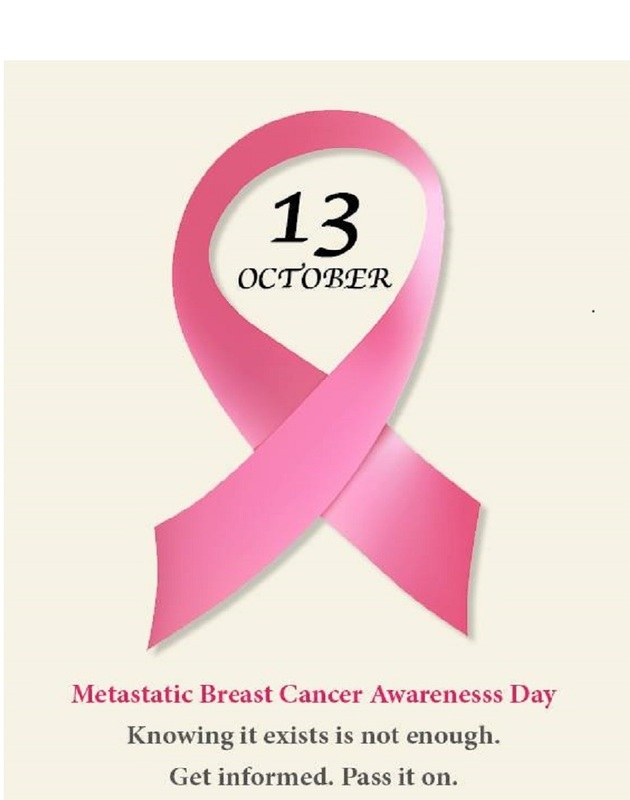 Whether it’s you, a friend, family member, or stranger, someone is currently undergoing treatment for breast cancer.While it can be difficult to help the people you care about during this difficult time, it is important to spread awareness about metastatic breast cancer and know the facts. For more information go to http://www.mbcn.org/. The California Medical Association (CMA) has published a new guide to help physicians challenge “interim payments” under the new AB72 out-of-network billing and payment law. The guide is free and available exclusively to members in CMA’s AB72 resource center. For more information click here and go to California News. Physicians who hope to earn a small bonus for the 2017 Medicare reporting year must start their 90-day performance period no later than October 2. While the actual reporting deadline is March 31, 2018, physicians need to identify and understand the measures that are relevant to their practice in order to successfully report on claims for the final 90 days of 2017. For more information click here and go to California News. USP has announced that will postpone the official date of General Chapter 800 (i.e., USP800) to December 1, 2019. USP800 was originally schedule to become official on July 1, 2018. For more information click here and go to National News. In honor of Breast Cancer Awareness Month, we acknowledge those physicians, clinicians and people who give hope and push forward on behalf of those women and men battling the disease. CalPERS Open Enrollment is September 11th through October 6th. You are encouraged to assist your CalPERS patients as to what to keep in mind when changing their health plan. For more information click here and go to California News. The Institute for Clinical and Economic Review (ICER) issued a final evidence report confirming that there is inadequate evidence to compare outcomes of PARP inhibitors for ovarian cancer. Advantages of oral treatment and lower side effects noted, but evidence judged inadequate to determine which patients stand to benefit from maintenance therapy. For more information click here and go to National News. Yesterday, October 2nd was the deadline to begin reporting one or more quality measures, improvement activities, or Advancing Care Information measures for the minimum 90 consecutive days for group practices and eligible clinicians (ECs) to earn a bonus in the Merit-Based Incentive Payment System (MIPS) in 2019. For more information click here and go to CMS News. For the past few years PBM’s (pharmacy benefit managers) have allowed many in-office pharmacy dispensing to be in-network to dispense drugs to patients, but have only allowed the initial script to be filled. All subsequent scripts are to be filled by a specialty pharmacy of the PBM’s choosing. For more information click here and go to Affiliate Association News.